It never ceases to amaze me how quickly the twice-a-year reunions at the Scottish Rite Valley of Danville roll around. 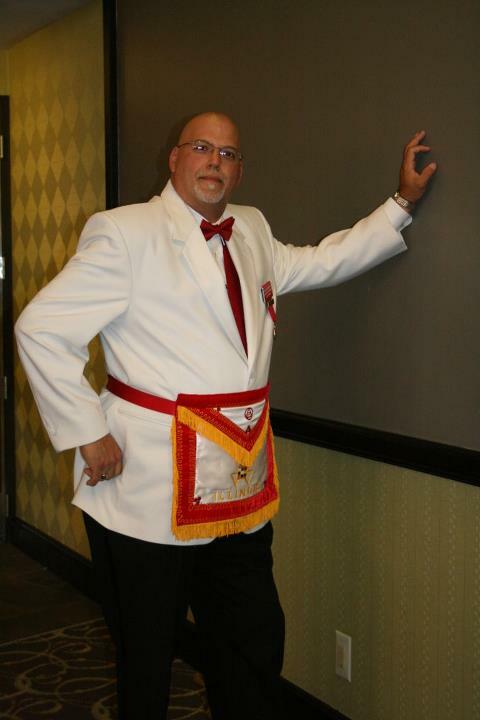 It's coming right up again, so I thought this week on my usual weekly feature "Freemason Wisdom" I'd feature somebody from the Valley of Danville (IL). "A lot of people look up to me . . . probably because I'm so tall." I had a tough time selecting the quote this week--this is just one of many stunning quotes I have collected from this insightful man over the last five or six years. I've been lucky, as his official biographer, I've had both the access, and the opportunity to watch him work. Being around him must be like it was watching Einstein at the chalkboard, or Sherlock Holmes interviewing a client, or watching the first time Elmer finally deduced "Hey, wait a minute, dat was the wabbit!" But seriously, I've met a lot of interesting people since I've become a Freemason, but by far one of the most interesting is the Illustrious William J. Hussey, Jr., 33°. It seems to be the goal of Bro. Hussey to remind us that although the work we do as Freemasons is very important, there is nothing wrong with having a little fun along the way. He's an individual that always brings something of himself into everything he's involved in--and what he brings into everything he does is entertainment. Between the Hawaiian shirt nights at his lodge, the chili cook-offs down in Southern Illinois, and the practical jokes, there is an air of chaos that naturally seems to surround him wherever he goes. When The Hussey is around, you just never know what might happen. Especially during one of our Valley's solemn (and rather dull) receptions after the reunion. You just never know who might come strolling in unannounced--the Blues Brothers, an old lady looking for her cat, or even Young Frankenstein doing a remake of "Puttin' On The Ritz." But it's always entertaining, and something many of us look forward to (and a few of us less smart Masons actually get dragged into helping with). Is that Marty Feldman? Or The Midnight Freemason? into Hussey chaos. Right? Lets just go with that, okay? But one thing I've learned about Bro. Hussey over the last few years, is there is one thing he takes very seriously--our fraternity. There are few more dedicated to ensuring the continuation of our fraternity than he is. His enthusiasm for our fraternity is contagious--I know, he gave it to me. One thing about Freemasonry that few talk about is that we all bring something unique to our fraternity. We all get the opportunity to offer something of ourselves to it. 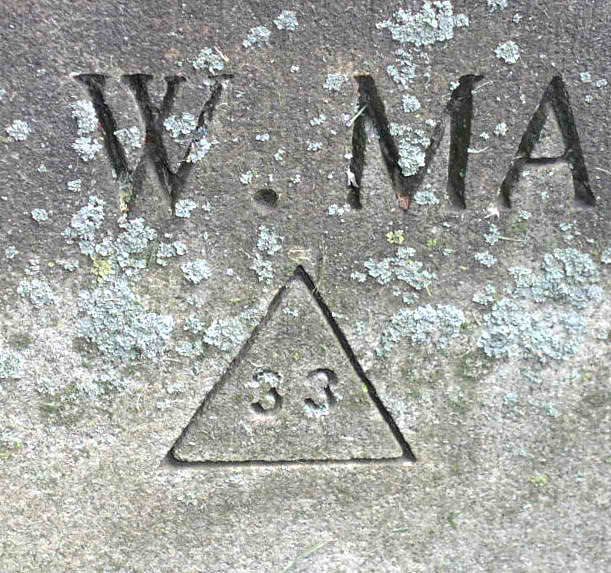 One of the first conversations I had with Bill Hussey wasn't that long after I became a Master Mason--I joined the Scottish Rite a couple months after I was raised a Master Mason. He corrected me on a misconception I had about the fraternity. 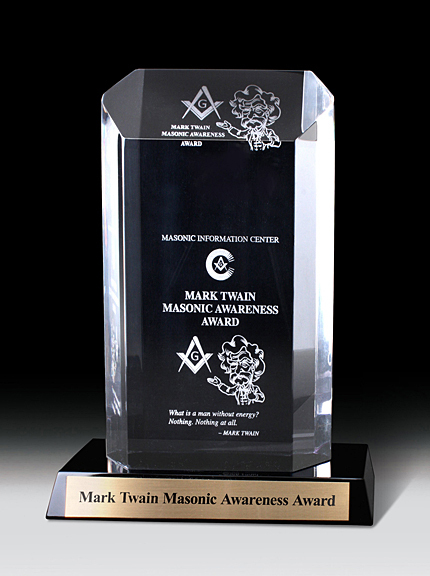 I'd been told several times that I'd get out of Freemasonry what I put into it--in some ways that is true. But Bill had a different take on it, and one that worked much better for me. 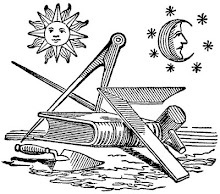 He told me early on, that Freemasonry is what I made of it. Freemasonry isn't a pre-defined path we follow--it's a journey. It's personal. We follow our own path, and when we're willing to offer something unique, we get something unique out of it. When we're willing to say yes, rather than no, it's remarkable the places that we can go (that almost sounded like Dr. Seuss). It's not the same for everyone, and we don't get the same things out of it. Bill was absolutely right. It is what you make it. "I'm sorry. What's your name again?" "Nice you to meet 'You Idiot.' My name is Bill Hussey." 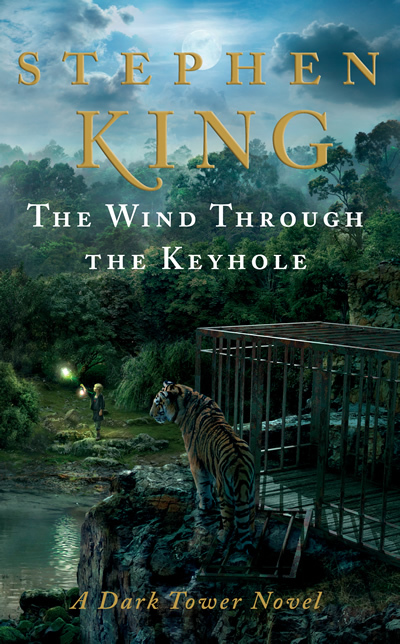 As you know, I occasionally review books on The Midnight Freemason, and every time I mention Stephen King's Dark Tower Series, the hit count goes through the ceiling--so why not do it again? Here we are less than a month away from the release of the first Dark Tower book since we thought he finished the series in 2004. I guess he had a little more to say about Roland's world after all. 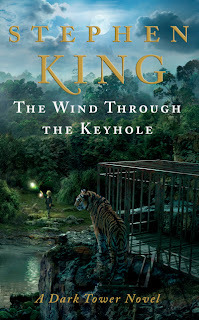 Stephen King’s Upcoming Dark Tower Novel, The Wind Through The Keyholeis due out on April 24, 201. In this new book, we join Roland and his ka-tet as a ferocious storm halts their progress along the Path of the Beam. As they shelter from the screaming wind and snapping trees, Roland tells them not just one strange tale, but two–and in doing so sheds fascinating light on his own troubled past. In his early days as a gunslinger, in the guilt-ridden year following his mother’s death, Roland is sent by his father to a ranch to investigate a recent slaughter. Here Roland discovers a bloody churn of bootprints, clawed animal tracks and terrible carnage–evidence that the ‘skin-man’, a shape-shifter, is at work. There is only one surviving witness: a brave but terrified boy called Bill Streeter. Roland, himself only a teenager, calms the boy by reciting a story from the Book of Eld that his mother used to read to him at bedtime, The Wind Through The Keyhole. "A person’s never too old for stories," he says to Bill. "Man and boy, girl and woman, we live for them." Most of the people holding this book have followed the adventures of Roland and his band—his ka-tet—for years, some of them from the very beginning. Others—and I hope there are many, newcomers and Constant Readers alike—may ask, Can I read and enjoy this story if I haven’t read the other Dark Tower books? My answer is yes, if you keep a few things in mind. First, Mid-World lies next to our world, and there are many overlaps. In some places there are doorways between the two worlds, and sometimes there are thin places, porous places, where the two worlds actually mingle. Three of Roland’s ka-tet—Eddie, Susannah, and Jake have been drawn separately from troubled lives in New York into Roland’s Mid-World quest. Their fourth traveling companion, a billy-bumbler named Oy, is a golden-eyed creature native to Mid-World. Mid-World is very old, and falling to ruin, filled with monsters and untrustworthy magic. Second, Roland Deschain of Gilead is a gunslinger—one of a small band that tries to keep order in an increasingly lawless world. If you think of the gunslingers of Gilead as a strange combination of knights errant and territorial marshals in the Old West, you’ll be close to the mark. Most of them, although not all, are descended from the line of the old White King, known as Arthur Eld (I told you there were overlaps). For longtime readers, this book should be shelved between Wizard and Glass and Wolves of the Calla . . . which makes it, I suppose, Dark Tower 4.5. As for me, I was delighted to discover my old friends had a little more to say. It was a great gift to find them again, years after I thought their stories were told. I guess the most surprising thing for me so far, is that the book listing on Amazon indicates it's only 320 pages--that's pretty short for a Stephen King novel. Could that suggest more is on the way? One thing that Benjamin Franklin seemed to understand was that happiness comes from within. He knew that even with virtually limitless freedom and liberty, there would always be those that would never find happiness. The same is true today. We all know people that seem to have everything, and aren't happy. They seem to go through life looking for that one thing they need to make them happy--the perfect person, car, house, job. And when it comes along, they still aren't content, because it wasn't what they thought it was--it didn't bring them the happiness they expected. So they keep searching for that one thing they need . . .
Franklin was correct. Happiness comes from within. In order to be happy, we have to know ourselves, and that involves seeing the truth about ourselves. Many of us spend more time worried about what other people think about us than what we think about ourselves. It's tough looking at ourselves warts and all. So instead of facing that truth, digging down into who we really are and what makes us tick, we spend our lives trying to fill the void that lack of understanding ourselves creates with things (and medications), none of which will ever make us happy. Only when you can look at yourself, and accept yourself as you truly are, can you ever be truly happy. We've all done it at one time or another--hopefully not too often. We say something we shouldn't have and later regret it. The first thing we think isn't always the best thing to say. I don't remember how many times growing up I was reminded of the importance of learning to engage that clutch between brain and mouth. It was good advice then, and it still is. Sometimes it's necessary to be blunt, but those occasions are few and far between. More often than not, it's more important to think before you speak, and master those words that cause more harm than good. Tact is a virtue. That one isn't quite as eloquent . . . 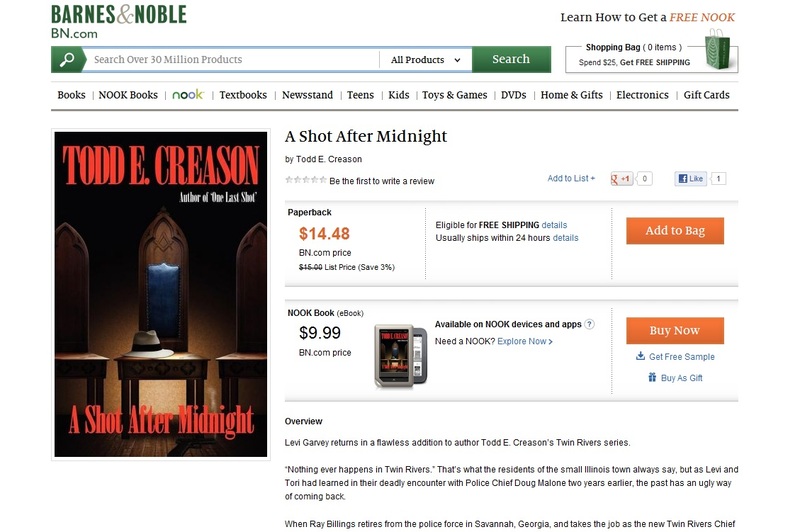 Although the Nook and Kindle editions have been available for nearly a week, the paperback copies of A Shot After Midnight are now available at Barnes & Noble and Amazon. Buy it at Barnes & Noble, and you can save 2 cents off retail! You better move fast--a deal that good is not likely to last. 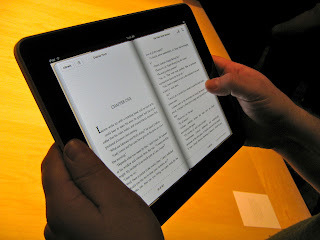 It's been interesting watching over the last few years as e-books have become so prevalent. Actually, about 80% of you are reading my books on your Nook or Kindle--that's exactly opposite of what was true three years ago. So I have a little more news for those of you hi-tech readers that are playing with your new iPads this week. Both of the Famous American Freemasons books, and A Freemason Said That? (my collection of great quotes from famous Freemasons you so often see on here) are available at iBookstore. Be sure and check that out. Sir Knight Robert Johnson has been busy--episode Number 34 of the podcast Whence Came You? is up and ready to be enjoyed. I listened to it earlier this week. And if you're reading this, it's easy to do--he gave me permission to post a link right here! There's a little player in the right column (I even moved it up so you can see it easier), and if you click on it, you'll hear it. From that link, you can get to all of Bro. 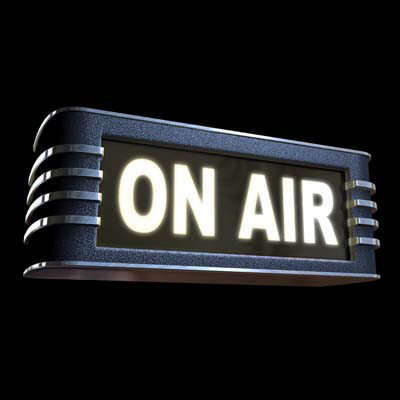 Johnson's broadcasts from the very beginning. Be sure and check it out. 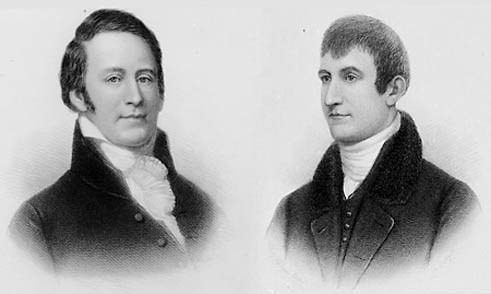 We all know who Lewis and Clark were--they lead the Corps of Discovery Expedition across the Pacific Northwest all the way to the Pacific Ocean. And both men were Freemasons. Their trek was nearly 8,000 miles and they accomplished it in just over two years. But there are parts of that journey you may not be aware of. 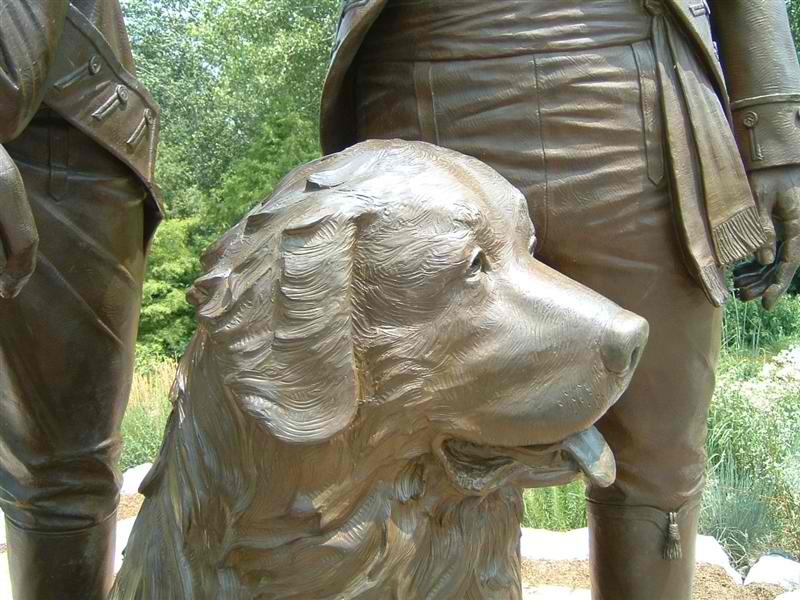 ~Lewis and Clark were accompanied by a giant Newfoundland dog that weighed somewhere between 110 and 150 pounds. His name was Seaman, and he made the entire journey. He often hunted for the explorers, delivering geese, squirrels, and one time an antelope that he caught and drowned in a stream for the men to eat. He also alerted the camp at night of the approach of grizzly bears and Native American Indian raiders that often stole horses, supplies, and canoes. He was a very good dog. ~On the return trip home, Lewis was accidentally shot by a member of the Corps of Discovery--one of the party's hunters who was described as blind in one and, and unable to see well out of the other. He mistook Lewis as an Elk, and shot him in the thigh. ~Despite the long odds, the Corps of Discovery only lost one member of the party. Sergeant Charles Floyd died of acute appendicitis shortly after the journey began. ~Not only did the Corps of Discovery learn the geography and terrain of the American West, and mapped many of the rivers and streams, but they also learned about 178 plant species and 122 animal species. They sent many samples they collected back to President Thomas Jefferson--including a live prairie dog! ~Lewis and Clark, by mapping the Northwest territory not only helped establish a claim on the Oregon territory, but because of the great amount of attention the newspapers spent talking about the discoveries of the Corps of Discovery, the idea of Western expansion caught on. And Jefferson's dream of a nation that stretched from sea to shining sea eventually became a reality. So, with all the kindness I can muster, I give this one piece of advice to the next pop star who is asked to sing the National Anthem at a sporting event: save the vocal gymnastics and the physical gyrations for your concerts. Just sing this the way you were taught to sing it in kindergarten straight up, no styling. Sing it with the constant awareness that there are Soldiers, Sailors, Airmen and Marines watching you from bases and outposts all over the world. Don't make them cringe with your self-centered ego gratification. 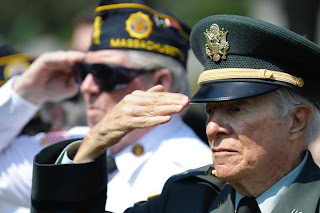 Sing it as if you are standing before a row of 86-year-old WWII vets wearing their Purple Hearts, Silver Stars and US Flag pins on their cardigans and you want them to be proud of you for honoring them and the country they love, not because you want them to think you are a superstar musician. They could see that from the costumes, the makeup and the entourage. Sing the Star Spangled Banner with the courtesy and humility that tells the audience that it is about America--not you! I couldn't have put it any better myself, however, there is just one thing I would add . . . 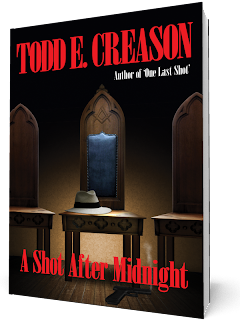 Even though the print copies are a couple weeks away, the NOOK and KINDLE versions of A SHOT AFTER MIDNIGHT are now available for download! 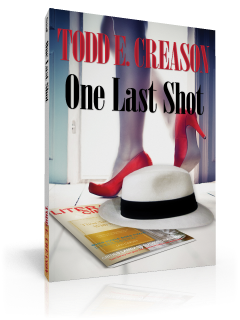 And remember, this is the second book in a series: the first novel ONE LAST SHOT is also available for NOOK and KINDLE, and of course in paperback! Levi Garvey returns in a flawless addition to author Todd E. Creason's Twin Rivers series. "Nothing ever happens in Twin Rivers." That's what the residents of the small Illinois town always say, but as Levi and Tori had learned in their deadly encounter with Police Chief Doug Malone two years earlier--the past has an ugly way of coming back. When Ray Billings retires from the police force in Savannah, Georgia, and takes the job as the new Twin Rivers Chief of Police, he believes it's going to be a gravy job. And the part he is looking forward to the most is renewing his long-time friendship with Levi Garvey. But Ray barely has a chance to settle in when the crack of a rifle shatters the peace and quiet of Twin Rivers and sets him and the Garveys on a life-and-death hunt for a killer who has returned after nearly forty years to silence the last witnesses in a decades old bank robbery. And in case you missed the first novel . . .
Levi Garvey thought he was just going home for a class reunion. He had no idea he was about to stumble upon a dangerous secret that would change his life forever . . .
﻿The best-selling author of two novels, Levi Garvey, is at a crossroads. 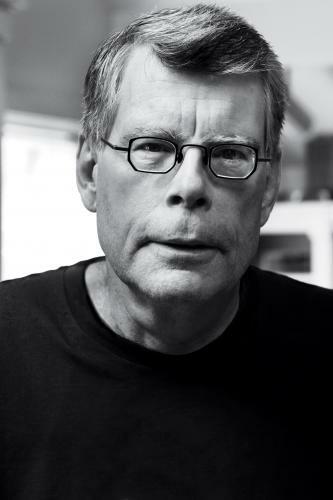 His third novel has been widely criticized as a flop. His celebrity lifestyle is falling apart, but he fears there isn’t another book in him. Because the creative well has gone dry, he realizes it’s time to figure out the next phase of his life. Levi heads home to the small rural town of Twin Rivers, Illinois, for the first time in two decades to settle his grandmother’s estate and to attend his 25th high school reunion. It isn’t long before he’s reunited with the only woman he’s ever truly loved, Tori Buchanan. Then the unexpected happens. He gets the spark of an idea. As he works on it, he knows it could very well become his next novel. But as Levi researches this new novel, he stumbles upon a decades-old secret—a secret that will inexplicably change his life and the peaceful little town of Twin Rivers forever. Men come to Freemasonry for many different reasons, but for many, it's a beautiful family tradition--something fathers and sons (and grandfathers) can share in together long after the young man grows up and leaves the nest to strike out into the world on his own. The first time I'd made particular note of that was shortly after I joined the Scottish Rite. I was visiting the Valley of Indianapolis during one of their reunions, when somebody asked me if I'd take a picture. We went outside, and I took the picture on the front steps of the Indianapolis Scottish Rite Cathedral (many would argue, the cathedral is one of the most beautiful buildings in the world, and I would agree). As it turned out, I was taking a family picture of four-generations of Scottish Rite Masons--that's son (who had become a 32nd Degree Mason that day), father, grandfather, and great-grandfather. All four men grinning proudly in the bright fall sunlight. I know a lot of Masons, and I can tell you, one of the most priceless possessions some of these guys own is an heirloom--a lapel pin, ring, tie tack, cuff links--that belonged to a member of their family or a close friend who was a Mason. We're not talking about gold and diamonds here--sometimes it's nothing more than a $3 lacquered pin, or a set of $10 electroplated shirt studs. But when received, they are treated as priceless artifacts by those beginning their journey in the Craft. 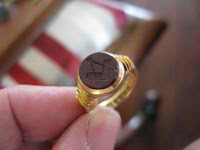 One of our Past Masters was given a Scottish Rite ring by one of his close friends and mentors when he joined the Scottish Rite, a friend of his who has since passed away. It means a lot to him. He wears it just about every meeting, and tells the story of where it came from often. We raised a young man a Master Mason a couple years ago in my lodge. After his degree, his father made a presentation to him. He gave the young man his grandfather's Masonic ring. I have no doubt he knew that ring well--he'd probably seen it on his grandfather's hand, and his father's hand many times. It had probably never occurred to him before that moment that one day he would wear that ring on his own hand. I'll never forget the look on his face as he put that ring on. In that moment, he suddenly realized he hadn't just become a Master Mason, in itself a tremendous accomplishment, but more importantly to him, he'd just become the third generation of Masons in his family, and I'm sure every time he looks at that ring, he thinks of his departed grandfather. as Master. My first time, the hat's second. It had sat the Master's head in 1949. I think it was happy to be out of the box. One of the greatest honors a Mason can receive is being elected Master of his lodge. 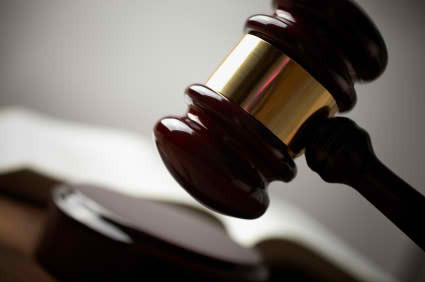 I won't even get started on gavels--that's a blog post in itself. Master's have the distinction of wearing a hat. That hat is something a newly elected Master thinks a lot about, and very often, that hat belongs to a previous Master of the lodge, or perhaps a mentor, or a family member. 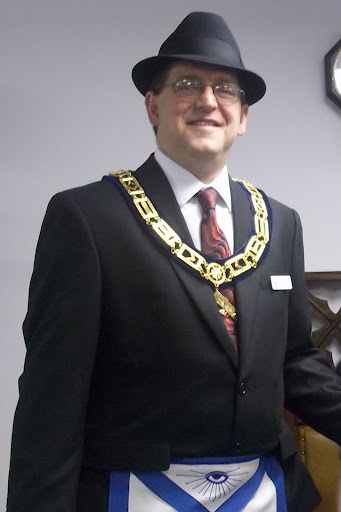 I wore a special hat that belonged to a close family friend and Past Master of my lodge--Raymond VanBuskirk. 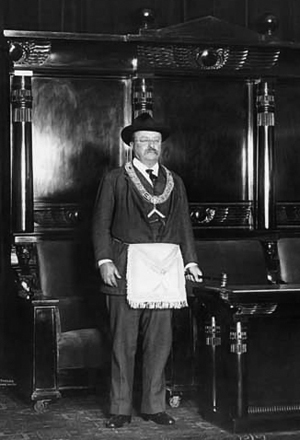 He was the Master of my lodge in 1949. 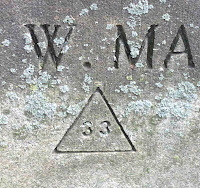 He had been like a grandfather to me growing up, and when I decided to petition to become a Mason, he signed it on the top line--after the longest conversation the two of us ever had about why I wanted to join. It was a conversation that forever changed our relationship--we went from our previous relationship of being almost grandfather to grandson, to Masonic Brothers in 90 minutes. When I left that meeting, there was no question in my mind how important he saw the journey I was about to take was to him. And my life has never been the same since. That was before the books, the blog, the website, the articles, and all that has come since. He passed away when I was Master of his lodge--which is how I always saw it. But I think about him every time I slip his old ring on my right finger when I prepare for a Mason event--that priceless relic that takes me back to my very roots. And in many ways, I'm more honored by that ring I wear on my right hand, than I am by the one I wear on the left--the one with the "33" on it. The irony that I had to have Raymond's ring sized down to fit me isn't lost on me--they are big shoes to fill. Those lucky enough to have been given or have inherited an heirloom cherish those items (even a $3 pin). They remind us of those that have gone before us. They remind us of the importance of the work we do in the world. They give us a sense of tradition that goes far beyond just the noble traditions of the world's oldest fraternity--it makes our journey in Freemasonry much more personal. It reminds us each time we dress for a Masonic event, just how large the footprints are that we follow. It gives us inspiration to make those who gave us those priceless treasures proud of us. It's not the honors we receive after, it's those that motivated us originally to pursue them that matter. "The greatest teacher I know, is the job itself." Americans have always been driven by success, but sometimes we forget that we often learn more through a failure than we do by an easy win. One thing I've learned through my research into Famous American Freemasons, is that those most successful among us suffered horrific misadventures along life's path. It was through those epic fails that they learned important lessons, and through those errors in judgement, they gained the wisdom to go forward. It's seldom the first try that leads to a win, it's usually through persistence and a stubborn refusal to let a defeat define us, that we are able to move ahead. Those who have never failed, have never tried very hard. So when life tosses you a curve ball, and you're sitting there wondering how you could have been so stupid, just ask yourself one question--what did I learn? I thought this was very informative. Many have wondered what truly goes on in a Lodge of Freemasons. I must admit, I was a little shocked at just how accurately this video depicted what actually goes on during our secret meetings. 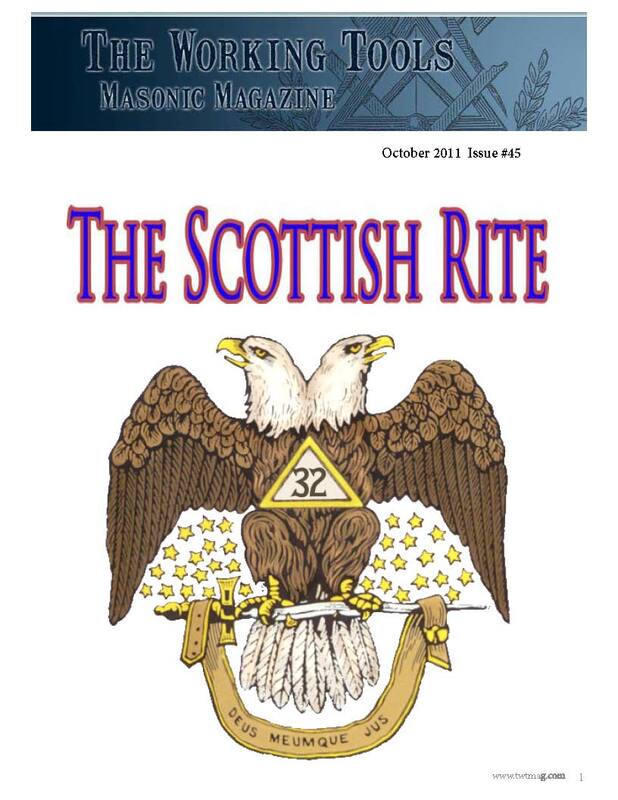 Some time ago, I wrote a piece about the Scottish Rite of Freemasonry which is an appendant body of Freemasonry. I received a lot of email about that article, and the most common question was what is an appendant body. Basically, these appendant bodies are "fraternities within the fraternity." Once you're a Master Mason, you can join any of a number of appendant bodies--the Scottish Rite, and the York Rite are the two best known and offer additional degrees to the three craft degrees a Master Mason receives in his blue lodge. 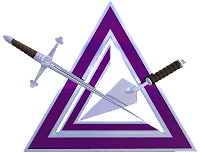 While I'm a member of all three bodies of the York Rite, I'm not exactly an expert--I haven't spent very much time as of yet enjoying my membership in the York Rite. So this is pretty basic information, and if I get anything wrong, I'm sure somebody will let me know. 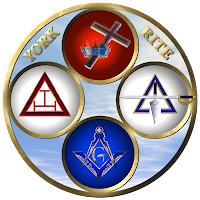 There are three bodies within the York Rite, each conferring a series of degrees (ten in all)--the chapter, council, and commandery. Membership is the Council is not required in some jurisdictions for membership in the Knights Templar. 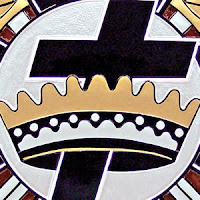 The Knights Templar is unique in Masonry--while other Masonic bodies require only a belief in a Supreme Being regardless of religious faith, membership in the Knights Templar is open only to Christian Masons. Although it has been long claimed that the historic Knights Templar founded Freemasonry, or at the very least took refuge within Freemasonry to avoid persecution, there is little evidence to support such claims. Besides being a Christian, in order to join the Knights Templar, members must have completed their degrees in the Royal Arch Chapter, and in some places, the Cryptic Degrees as well. As I said I'm not an expert in the York Rite, but I will tell you, that the degrees of the York Rite are some of the most ancient degrees in Freemasonry, and the ritual presentations, by far, impressed me the most. 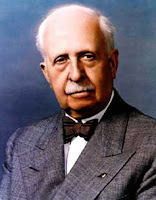 There are many, many appendent bodies of Freemasonry, and perhaps in the upcoming weeks, I'll take a little time to talk about a few more of them. If you would like more information about the York Rite, I would recommend Christopher Hodapp's book Freemasons for Dummies. Don't let the name of the book fool you, it's one of the best resources for both Masons and non-Masons alike about our Fraternity. I reference his books often when I'm fact-checking blog posts like this one. In fact, all of Christopher Hodapp's books are excellent. And be sure and check out his blog--there's always something of interest on the Freemasons for Dummies blog. I check it every day. 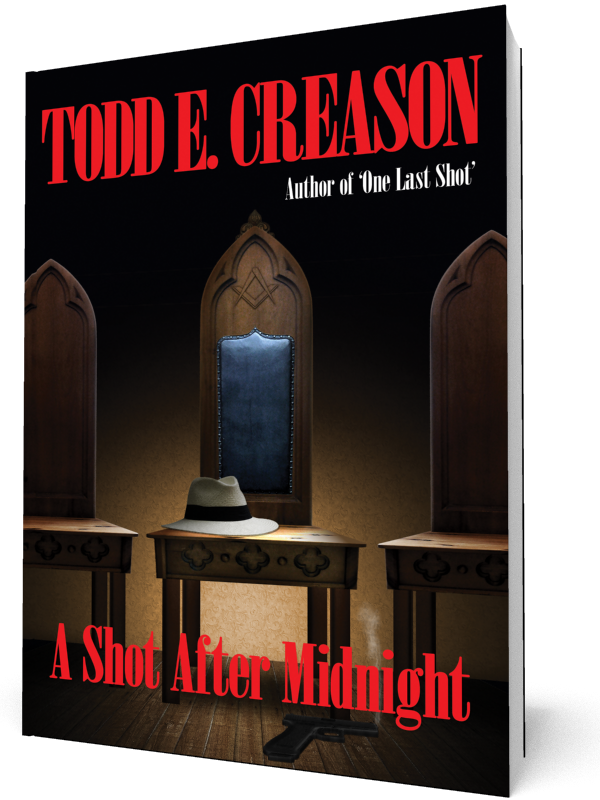 My fifth book A SHOT AFTER MIDNIGHT is almost ready for publication--it should be out (hopefully) by the middle of April 2012. I'll give you the official back cover treatment first, and then I'll tell you a little more about it. So this is another installment of the Twin Rivers Series. The first book One Last Shot was published in April 2011. Whether I'm writing about Famous American Freemasons or writing fiction, I seem to think only in multiple volumes. And I'm sure this novel isn't the last story from the small town of Twin Rivers. This one is paced a little differently from the first book. In the first book, I tried to trick the readers into thinking at first they were reading a pleasant little story about a man returning to his hometown after 25 years, getting back with his one true love--and living happily ever after in quiet rural contentment. Of course, just about the time the reader was waiting for the love story to begin, I tossed in a hand grenade, and everything went to hell in a hand basket. So this time around, there was little question what kind of stories I like to write, so I just went ripping into it. The whole cast of character is back in this one (except the ones that didn't make it through the first novel obviously)--and many new characters, too. My Freemason friends were a little disappointed the first book didn't offer much about Freemasonry--they won't be disappointed this time as the cover might allude (we like that word allude). But I will tell you up front, Freemasonry is only a backdrop in this book, and not a part of the story--I'm not Dan Brown, and I have no interest in ever doing that. But this was a fun book to write, but by far the one that has challenged me the most. It just about didn't happen, if it weren't at the constant prodding from my editor (mom) that it was a great story it would have never been finished. I'd like to give special thanks to Brion Sausser. He's a very talented artist, and he did the amazing cover for One Last Shot (and if you bought the first book, you know that the back cover was just as impressively designed as the front. So obviously, I called him again, and he certainly didn't disappoint me on the cover for A Shot After Midnight. In fact, he took a much larger role in the project this time. He not only designed the cover, but he also did the interior design as well--and it looks great! He's also designing the e-book versions for the iBook, Nook, and Kindle editions. So be sure to check out his website at Book Creatives. He's great to work with, and offers a full range of services, from book design, to marketing, to website creation. So that's that story. Watch for it! Spring Is In The Air: Are You Ready For Some Baseball? Every year I do this post, and it’s about the same post every year—different pictures, and a few additions to the text each year, but I don’t change it very much. It’s about the great American sport of baseball. I’m a Cub fan, so every year, as the season approaches, I think about what the sport means to me. I’ve spent many happy hours at the Friendly Confines of Wrigley Field, and each year, I do this tribute to baseball, and it’s most famous broadcaster, who many of us still miss every game—Mr. Harry Caray. And no, in case you’re wondering, he wasn’t a Freemason. So here it is . . . 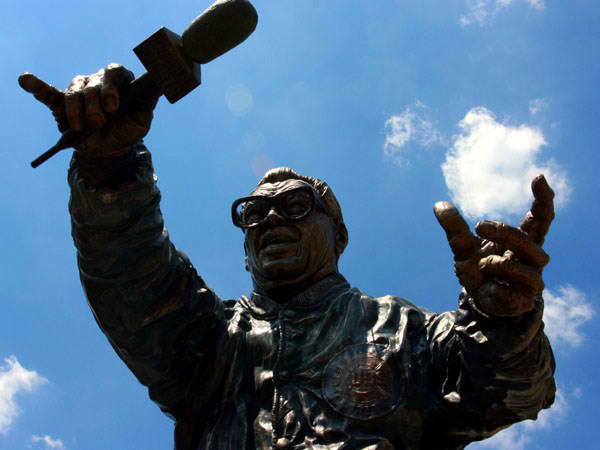 It's hard to believe it's been fourteen years since Harry Caray left us. As many times as I visited Wrigley Field over the years, you'd think I would have seen Harry Caray sing "Take Me Out to the Ballgame" dozens of times, but in reality, I usually spent that time scrambling to get the last beer of the game while I could (a practice I'm sure Harry wouldn't have faulted me for). To this day, every time I hear "Take Me Out to the Ballgame" I get both thirsty and anxious at the same time. 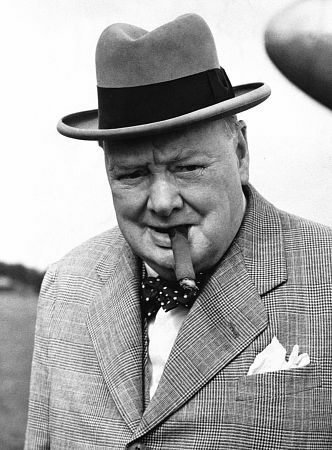 I wonder if Harry knows he trained thousands of beer drinking baseball fans the same way Pavlov trained his dogs? Every year, on opening day, I think about Harry Caray, and how much I used to enjoy listening to him, and how much I miss hearing him still. See there used to be this thing called "radio" and people used to listen to games on this device in their cars, or at work, and sometimes by way of a hidden earpiece at church (everybody knows that guy, and he usually busted himself out by cheering out loud during the sermon when a great play was made). Nobody announced like Harry "It might be . . . it could be . . . it is! A home run!" 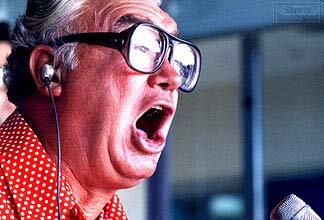 And there was nothing sweeter after the last pitch of a tough game than hearing Harry Caray shout "Cubs win! Cubs win! Cubs win!" 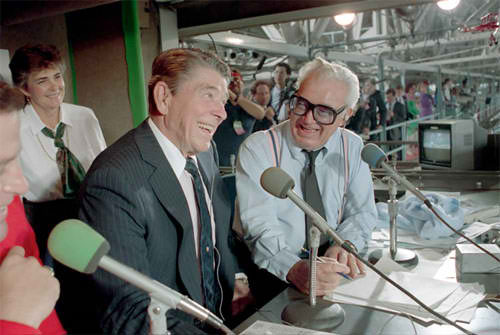 They still play a clip of Harry shouting that after Cubs game broadcasts every so often, and still love hearing that voice from the past, and it still has the same effect on me to this day. A statue forever immortalizes Harry Caray's contributions to the Chicago Cubs outside the Friendly Confines. For those of us who are old enough to have heard him, he'll always be as much a part of Chicago Cub-lore as Wrigley Field, the ivy, the goat, the old green scoreboard, and the seventh inning stretch (oh yeah, and the ice cold Old Style in the bleachers). It doesn’t matter if you’re a Cub fan, a Pirates fan, or a Yankees fan—it’s about the game. I think they have a team in St. Louis, too—I’m trying to remember their name . . . oh, yes, the Cardinals. Just kidding. 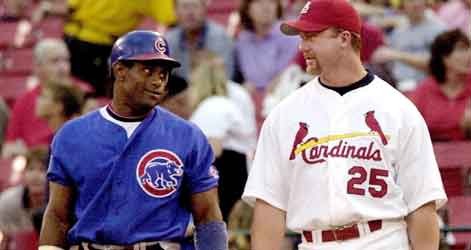 Actually, it was that legendary rivalry between the Cubs and the Cardinals that helped bring baseball back after the strike—two heavy hitters named Sosa and McGuire. For those of you too young to remember . . . this is what the seventh inning stretch sounded like back in the day. Did you see the sign--"Win or Lose, It's the Cubs!" We all wind up there one day, and this is a collection of tributes paid to famous Freemasons when they finally pass into that house not built by human hands--the Celestial Lodge. 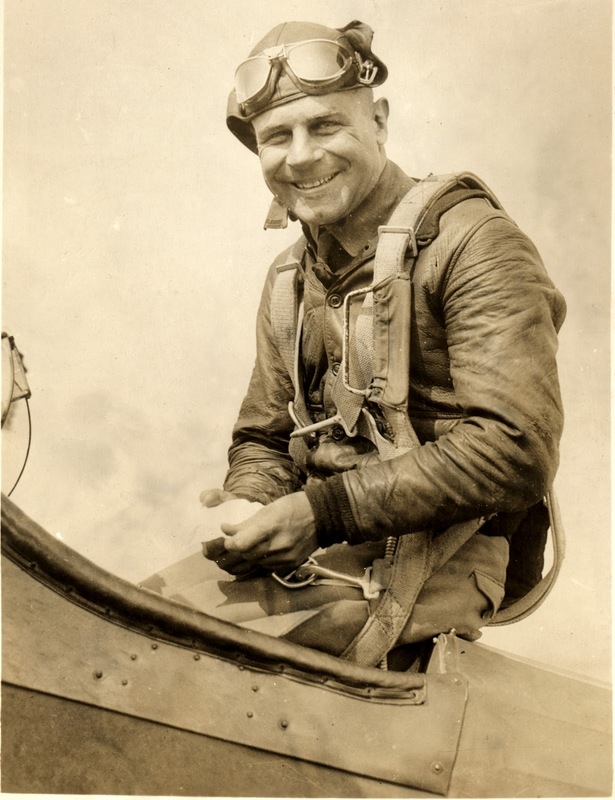 When Jimmy Doolittle died in in 1993, he was buried at Arlington National Cemetery with full honors. One of Doolittle's raiders attempted to play "Taps" at the service, but overcome with emotion, he was unable to finish. He passed the bugle to a young man, who finished it flawlessly as the few remaining B-25s in existence flew overhead in his honor. The young man that finished "Taps" was Jimmy Doolittle's great-grandson. In 1979, Hollywood knew they were about to lose one their favorite leading men. As John Wayne's condition worsened, a large group of Hollywood actors and actresses descended on Washington D.C. lead by one of Wayne's favorite co-stars Maureen O'Hara. They testified before Congress, and Congress listened. On his 72nd birthday, May 26, 1979, he was awarded the Congressional Gold Medal. On one side, the medal shows Wayne on horseback, and on the other was his portrait and the simple words, "John Wayne, American." 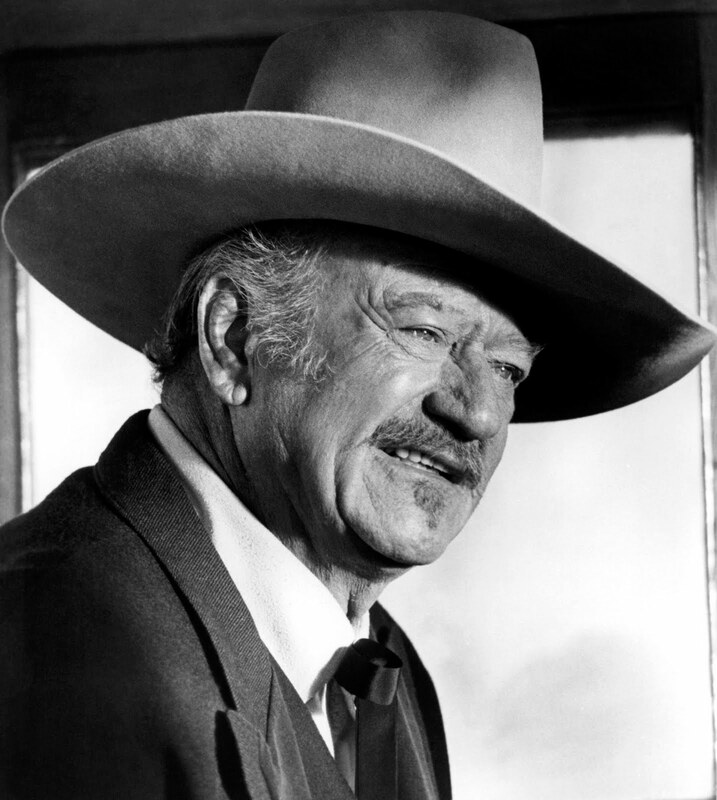 A fitting tribute to The Duke--one of Hollywood's greatest actors. 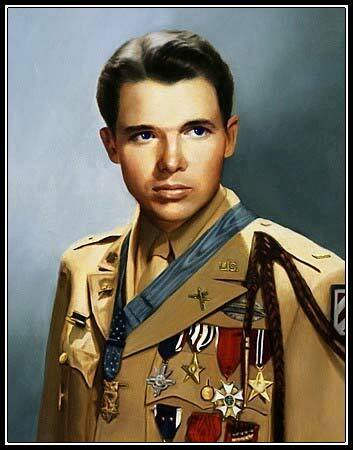 Audie Murphy was the highest decorated soldier of World War II, his awards including the Medal of Honor. He was buried at Arlington National Cemetery in 1971 with full military honors. The gravestones of recipients of the Medal of Honor are normally decorated in gold leaf, but Audie Murphy had specifically requested his stone remain plain and inconspicuous--that of an ordinary soldier which was the way he saw himself. Even so, a special walkway had to be constructed later because of the large number of visitors who came to pay their respects. 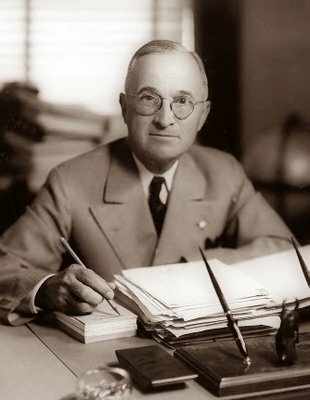 His grave site is the second most visited at Arlington, second only to President John F. Kennedy. 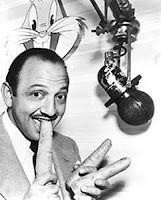 Mel Blanc, the Man of 1,000 Voices, dedicated his life to making people laugh with his unique talent--especially children. In fact, he showed up at Shriners Hospitals regularly, visiting the children who were patients there, and doing the voices of their favorite cartoon character. He once said, "Visiting these brave kids makes you count your blessings, and your own troubles seem very small by comparison." 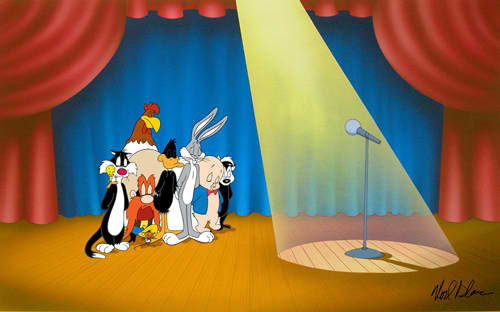 When Mel passed away in 1989, Warner Brothers honored him with a touching special lithograph that showed many of the Looney Tunes characters he'd voiced during his long career standing with their heads bowed behind the empty microphone. The inscription on the bottom read "Speechless." But even in death, Mel wasn't done making people laugh--he managed to get one more. According to his wishes, the epitaph on his tombstone reads simply, "That's all, folks!" When we have a decision to make about something, it's human nature to seek out advice or information from somebody we respect that sees things the same way we do. The same is true when it comes to how we view larger issues in the world. If our ideological beliefs lean one way, we might read this certain newspaper, and watch this particular news program, and same is true if we lean the other way. We fall into a mindset that everything our newspaper says is right, and everything their newspaper says is wrong. But Harry was right--that's the wrong way to make judgments. He understood this tendency more than sixty years ago. You can't make an informed decision, or understand any issue completely hearing only half of the story. We live in the information age--complete knowledge and understanding of any subject or issue has never been easier to access. It's never further than a keystroke away. Yet we've never been more ideologically divided. That is because we don't listen to each other, and we don't try to understand each other. We don't educate ourselves as we should before reaching a consensus, because we surround ourselves only with viewpoints that agree with our position. We fail to understand that the truth and the solution to issues is always somewhere in the weeds between what our newspaper says, and what their newspaper says. We seem to be deadlocked these days, and the key to going forward is focusing on those things we all agree on, instead of squabbling over where we differ. So you may have noticed a small change in the right-hand column today. 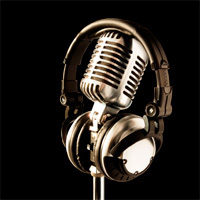 I've talked a little bit about the podcast Whence Came You? 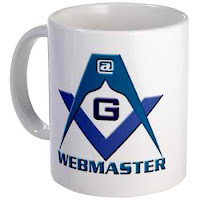 on a few occasions now--most recently in a post earlier this week Review: Three Great Freemasonry Websites. Well guess what? I've been talking to SK Robert Johnson, and he's made it possible for his podcasts to be available right here for your listening enjoyment! 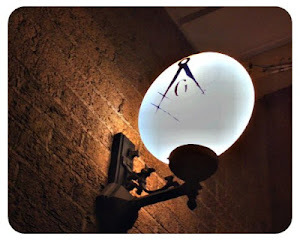 The Midnight Freemason is now an official syndicate. Few figures in history are more recognizable that Napoleon Bonaparte, military leader and later Emperor of France during the time of the French Revolution. His legendary ego almost as famous as his exploits. 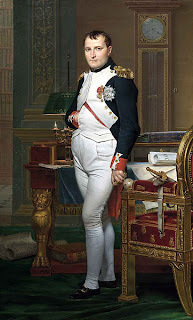 It’s often been said that Napoleon Bonaparte was a Freemason--initiated into a French Regimental Lodge, probably the Army Philadelphe Lodge in Malta between 1795 – 1798. But, there has always been some disagreement over that fact. Recently, a document from 1805 has surfaced that is supposed to prove that Napoleon was a Freemason. It is an account of a Masonic dinner attended by “Brother Bonaparte.” Whether this document ends the controversy or not has yet to be seen. So I believe in this particular case, it’s safe to say that the jury is still out on whether Napoleon Bonaparte was a Freemason. For a secret society, we sure don't do a very good job at the secret part, do we? A lot of lodges have websites or blogs now, most Grand Lodge do, too, as well as Scottish Rite Valleys and York Rite Chapters. But there's a few out there I enjoy in particular, because they not only inform, but they entertain as well--and that's what I try to do. So I thought I'd point you to three I really enjoy on a regular basis. One of my favorites! I check it every day. My friend and brother, Steve Harrison, never fails to entertain me. His posts are short, they are fun to read, and provide me with a great deal of fodder, which I often wind up using here, too. So check it out. I'd like to thank him for posting my video this week on the One Minute Mason, too. I think one of my favorite posts in the last few weeks was a story he told about Harry Houdini--Harry escaped from all sorts of things, but there was one trap that got him. Be sure and read The Trap That Houdini Could Not Escape. 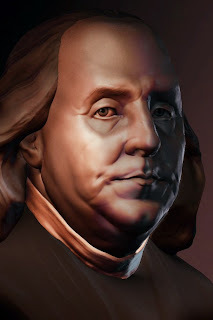 On Thursday, I posted a quote from Benjamin Franklin here. I wonder if it gave Steve pause. I kind of thought I'd hear from him. I borrowed that quote from him--not from his blog, but from his editorial remarks in The Missouri Freemason magazine which is circulated amongst all the Freemasons in Missouri. He probably thought there was no way I could have seen it, since I'm from Illinois. He must have just written it off as a heck of a coincidence that I'd selected one of the same quotes he'd used for my blog. Guess what? It wasn't. It was a great quote! This is a neat thing, too. Sir Knight Robert Johnson has a great thing going. He posts a regular podcast that I really enjoy. Now I didn't know what a podcast was until I ran across Whence Came You? They are short radio programs you can listen to on your computer, and wireless devices, etc. Don't worry, if you're not hi-tech, there's a little tool right on his site you can listen to his podcasts on (that's I listen to them). His broadcasts are excellent, in fact, that's how I came to know him. He shared one of the pieces I'd written on The Midnight Freemason with his listeners--Freemasons and Beer. His podcasts offer a little something for everyone. Usually a piece on Freemasonry, nearly always he features a piece about a famous Freemason--always full of content, and always gives me something to think about. He's been posting more blog entries lately, which are fun to read, too, and I was most impressed with a video he produced. In fact, that's why I decided I'd give the whole video thing a try. Watch it--he's way better at it than I am. Be sure and check out Whence Came You? According to his Facebook page, he's got a new podcast coming out today! Now this is a great magazine! Editor Cory Sigler has done a great job putting together a magazine that features a lot of unique content, a lot of guest contributors (including me), and some regular features that I look forward to each month. The March 2012 issue is out, and it's a hallmark--the 50th edition! No small accomplishment--this isn't a newsletter by any means, it runs, on average, about fifty pages. The newest edition features articles by eight Masonic authors, and recaps some of the fun editor Cory Sigler had a Masonic Week in Virginia. And if you took my advice earlier, and visited the One Minute Mason, you'll be pleased to know he's a regular contributor to the magazine as well. Now I'll be honest, I picked these three for a reason, as you've probably figured out. Our paths cross from time to time. You'll find their stuff on here, and you'll find my stuff on their blogs, magazines, websites, and podcasts from time to time. We all do the same thing, each in our own unique way--we share our love of the fraternity hopefully in way that educates and entertains. We all seem to share a genuine disdain for the bland and boring.